After two days of cloudy skies and heavy rain, it was nice to have a bright sunny day for the Thanksgiving holiday here in New York City. This quick turnaround in the weather reminded me of a piece of poetry that I recently came across. The poem is called The Cloud and was written by Percy Shelley in 1820. It uses the weather as a metaphor, but highlights the fact that the atmosphere is in a continuous state of change. Clouds, visual indicators of atmospheric activity, are diverse in their forms and functions, but are nonetheless ephemeral phenomena. A cumulus cloud, for example, usually only lasts between five and forty minutes, depending on the wind and other environmental conditions. Enjoy the poem. Fall foliage is a traditional sign of the change of seasons. In New York City, peak color is normally around the last week of October. 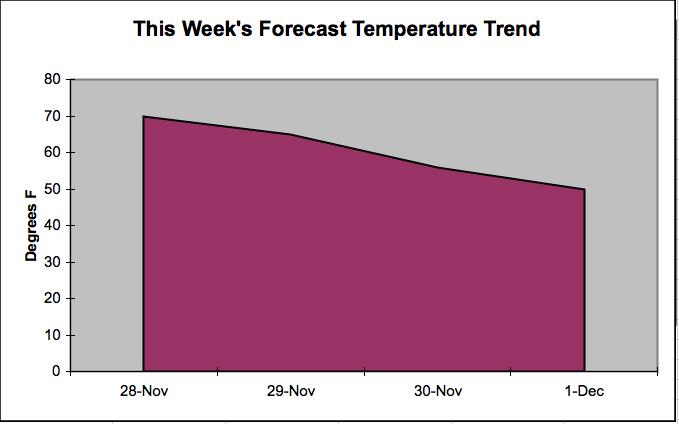 This year, however, we did not hit the peak until somewhere between the second and third weeks of November. Is this delay of fall color a sign of climate change? Fall foliage displays are strongly influenced by the weather and therefore vary from year to year. The late arrival of the fall colors this year could be an anomaly related to the exceptionally warm and wet conditions of the early autumn in the northeast. Delayed color changes, however, are also happening elsewhere around the globe. Climate change studies in both Europe and Asia have shown that leaves there have been changing color later in the season. Scientists working with satellite data at the Seoul National University in South Korea have shown that the growing season in the northern hemisphere was extended by 6.5 days from 1982 to 2008. Another study at the University of Southampton in England found that increased levels of carbon dioxide in the atmosphere is delaying the change of color in autumn leaves. Researchers there conducted an experiment with poplar trees and found that the those exposed to higher levels of carbon dioxide, a key component of photosynthesis, stayed green longer. Climate change is a complex subject. No one knows for certain how different aspects of the natural world, like the timing of fall foliage, will respond to changing environmental conditions. This highly nuanced subject, in my opinion, warrants closer study. San Francisco, a city known for its fog, is actually a composite of microclimates. Last week, I was visiting the Bay Area and was reminded of its unique climate situation. The area, in general, has a Mediterranean climate with mild, wet winters and dry summers. It is rare for the city to get warmer than 70°F in summer or cooler than 45°F in winter. Situated on a peninsula along the California coastline, San Francisco is kept mild by the Pacific Ocean’s chilly currents and local coastal upwelling. Famous for its hills, the city’s complex topography is another major influence on its climate. The Golden Gate, a break in the mountainous Coast Range, funnels Pacific air into the Bay Area. The hills and basins of the peninsula then capture and divert the circulating marine air in intricate ways, forming a variety of microclimates. As a result, weather conditions can vary widely across short distances, such as 10°F between neighborhoods. In San Francisco, the forty hills that form the center of the city create a general weather divide. 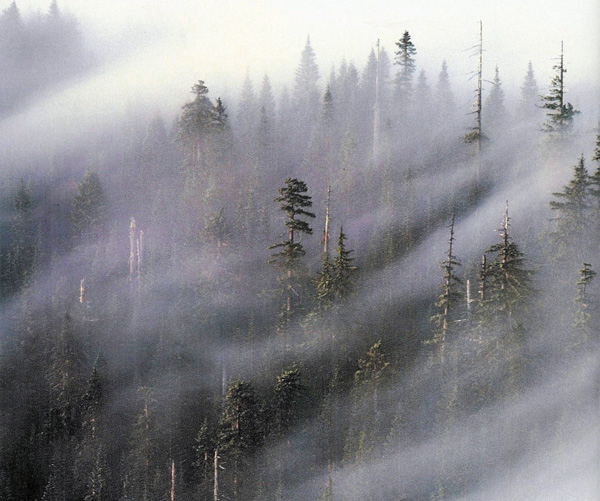 The western side of the city usually bears the brunt of the incoming Pacific air, with cool temperatures, strong winds, and fog. The more sheltered eastern side generally sees more sun and warmer temperatures. On a larger regional scale, temperature differences have an even wider scope. For example, the average high temperature in July in the city is 68°F, while temperatures can reach 100°F in the Sacramento Valley, just 50 miles inland. The drama of last week’s pre-winter snowstorm was heightened by the booming sound of thunder-snow. This is the term used to describe thunder and lighting that takes place during a large winter storm, a rare meteorological event. Thunder-snow, like any thunderstorm, is the result of convective processes. What makes it rare, is the fact that it requires very precise conditions that are unusual in winter. For example, the air near the ground needs to be warmer than the air above it, yet still cool enough to support snow. The main difference between thunder-snow and a regular thunderstorm is the form of precipitation that reaches the ground…snow instead of rain. Growing up in the northeast, I never experienced thunder-snow until last winter here in New York City. During that busy winter season, we heard it’s startling sound a few times. Last week’s pre-season snowstorm unleashed it again. For a rare phenomenon, it seems to be happening more often. I wonder if there is a reason for this increased frequency? October 2011 in New York City felt like a wild ride of weather. We had a bit of everything, from sunny 80-degree days to snow. 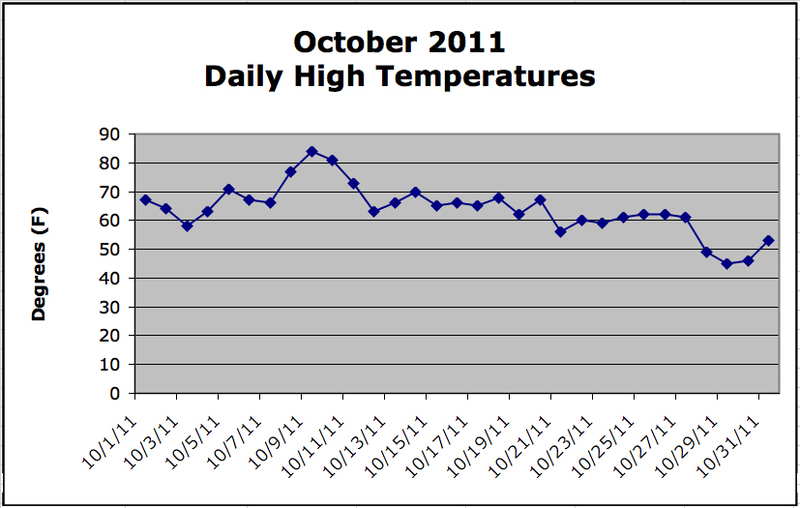 As a transitional month where we make our way from summer to winter, October’s wide temperature swings are not unusual. The record breaking snowstorm storm at the end of the month, however, was exceptionally rare. In the end, October finished wetter than normal with 6.09 inches of rain. That is 1.69 inches above average. We also had the record accumulation of 2.9 inches of snow. Most of this precipitation came at the end of the month with the nor-easter. In terms of temperature, despite the roller-coaster of changes, we finished exactly average at 57-degrees Fahrenheit. That is neither warmer nor colder than normal. What a month!